The Americana “Star Print” trend. As you’ve probably seen, the new print trend on the street is the americana style stars; upon dark backgrounds. Kate Moss wowed the crowds and her public at her 34th birthday last month in Chanel’s ensemble. Her hair (most probably styled by her personal stylist, James Brown) was reminiscent of our dear Carrie Bradshaws curls. Kate also proved herself to be the star of the show with the star print theme following through to her face makeup. Moss, glamorously stepped out of her taxi in a beautiful faux fur coat and wedged heels and gracefully stepped into her party held at London’s fantabulous PUNK nightclub in SoHo; this is where Smash and Grab is held by the Queens of Noize. However, this isn’t the first time the Chanel outfit has been out on display, Claudia Shiffer (below), was the first to wear it for a magazine shoot last year. So where can you purchase some star print to begin your way with the new trend this season? Well as always, ASOS.com is my first point of call online – its cheap as chips, and the quality is excellent! -Star Print Tea Dress, £38. Just like the print as seen on Kate Moss! -ASOS Petite Star Print Tea Dress, £30. I really think this print is similar to the ‘Clover Print Dress’, found in Kate Moss’s last collection from TOPSHOP. I absolutely adore this retro inspired jumper, I think it looks brilliant teamed with some simple skinny fit jeans! I think it’s a great idea from ASOS to provide a ‘Premium’ service also; other designers include, TWENTY8TWELVE, Chloe, Betsey Johnson, Christian Dior, PPQ and YSL just to name a few! 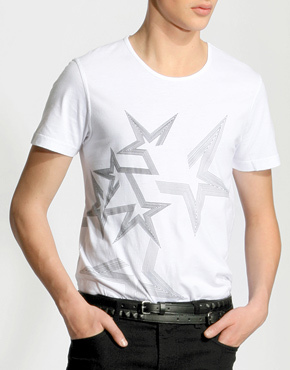 -Mens Star Print Tee, By Revolution, £30.